Focalprice is your one-stop store for all your electronic needs and more. They carry jewelry, automobile products, toys and a whole lot more. Each day there is a daily deal and you’ll find lightning deals. All orders over $20 ship free. Since they are located in Hong Kong, delivery can take any where from 2 to 3 weeks. My thought on their site – most of our products come from another country anyway; so if I can get a good deal – I’m all for it. I plan my purchases in advance if they are going to be gifts for someone else. 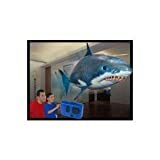 The Air Swimmer Shark you see to the right – he sells for $21.82 – cheaper than what you find at Amazon.com. Their only form of payment is Paypal – but that’s okay because you don’t need a Paypal account in order to make a purchase.